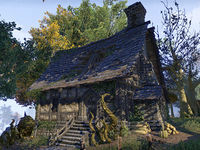 Chill House is an abandoned shack in southern Glenumbra, south of the Wyrd Tree. Below the shack is a cave which contains a special crafting site, where you may craft items in the Death's Wind set. Giraud Scraeg may be found hiding in the shack, along with the note Legend of Chill House.